Photo/PAUL KRAJNYAK ST. CLAIRSVILLE quarterback Dustin Carrothers is tackled during a game against Bellaire earlier this season. Carrothers has thrown for more than 1,000 yards in the Devils’ run-oriented offense. He and his teammates will take on Bloom-Carroll Saturday night at Zanesville. ST. CLAIRSVILLE — Each rung up the ladder of the Ohio postseason presents a different and stiffer challenge than the one before. As it pertains to the Division IV, Region 15 semifinals, St. Clairsville is as excited about that as ever. Because, to hear Brett McLean tell it, that and the constant studying of the new opponents are what makes the football tournament fun. 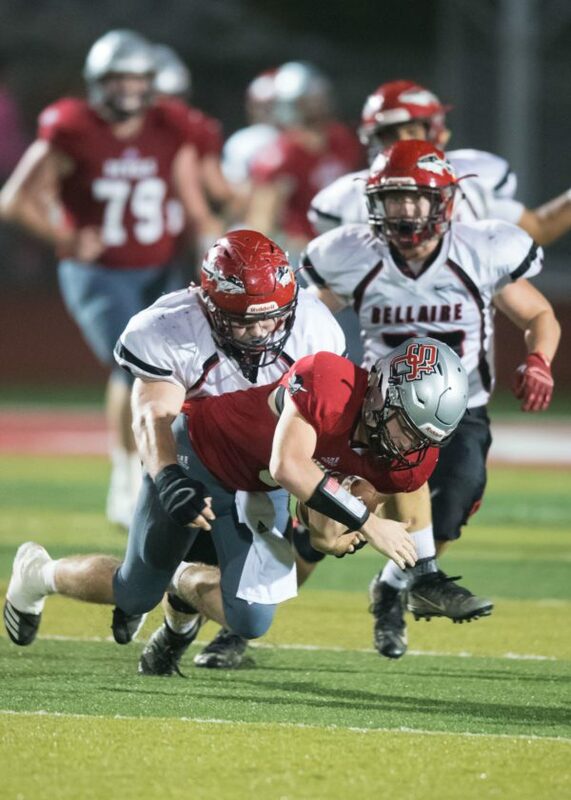 The fun will become the challenge Saturday evening when the Red Devils seek to make it 12 consecutive victories this season when they play at Zanesville’s Sulsberger Memorial Stadium against fourth-seeded Bloom-Carroll. Kickoff is slated is for 7 and the winner will advance to the regional championship game against the survivor of Indian Valley and Licking Valley. The Red Devils got to this point by virtue of a 34-6 victory against Proctorville Fairland last weekend at Red Devil Stadium. Meanwhile, Bloom-Carroll — a perennial baseball power in the Buckeye State — was taking care of Chillicothe Unioto, 38-7, on its home field. That win gave the Bulldogs their first playoff win in school history and it continued a team that may be a bit ahead of schedule in terms of it success. The underclass-dominated Bulldogs were coming off a playoff appearance in 2017, but lost 15 seniors, 11 of whom were crucial contributors, to graduation. The Bulldogs eventually finished 8-2, losing to Division II playoff entrant Teays Valley and a decisive, 59-9, setback to Columbus Academy. However, their eight wins were enough to propel them to their first Mid-State League title in 28 years. Meanwhile, last Saturday’s victory was the 14th playoff victory in the Red Devil’s illustrious history, which has included three regional titles. While Bloom didn’t return a lot in terms of quantity of experience, it did boast the return of an all-Ohioan at quarterback in junior Otto Kuhn, who has been brilliant all season. The 6-4, 190 pounder is drawing the eye of numerous FBS programs, including Pitt, Louisville and Michigan State to name a few. Though he doesn’t own an offer, Bartholomew believes he’s close. On the field, there isn’t a lot Kuhn isn’t capable of. He’s thrown for 2,093 yards and 23 touchdowns, while racking up a team-high 967 yards and 13 touchdowns on the ground from the Bulldogs’ empty-backfield and spread system. To prove how much Kuhns spreads the ball around, he’s thrown a touchdown to 12 different receivers this season and his leading pass catcher, junior Josh Evans, has made 32 receptions for 455 yards and 7 touchdowns. Sophomore Evan Willet is another to keep an eye on along with senior senior Gavin Powers. “Evan is a kid who is not afraid to go underneath or across the middle and Gavin is our vertical threat, who can run by people,” Barthlomew said. Once they got the first drive and a feel for the speed under their belts last week against Fairland, St. Clairsville’s defense played outstanding. Justice McCamick and Isaak Myers made life tough on Joel Lambiotte with their pass rush. Craig Bober, who hadn’t played hardly any defense all season, had two picks and talented sophomore defensive back Tyler Tonkovich also had an interception. Senior Kyle Storer — a tackle machine for the Red Devils — was also impressive from his linebacker post. Luke Ewing and Noah Trubiano also drew McLean’s attention. Barthlomew, who played his prep ball at Williamsport Westfall and actually lined up in a tournament game as a senior against Bellaire at Zanesville in 2006 a season before the Mustangs dispatched St. C. in a regional final, knows his team is going to have to be ready to block to provide Kuhn time. As Bartholomew watched St. Clairsville this week on film, he came away like most coaches knowing they need to stop the run. However, he also acknolwedges that knowing what to do and executing it can be vastly different. Bloom-Carroll is trying to find a way to slow down senior standout Brady Kolb, who has been impressive all season. The rugged runner has rushed an astounding 242 times for 1,649 yards and 27 touchdowns. His workload has increased the last few weeks because of the injury to Justin Heatherington. When Kolb gets a breather, the running work shifts to senior Aaron Jordan and his freshman brother Jacob Jordan, who have combined for 433 yards and 5 touchdowns. St. Clairsville’s offense is more balanced than it appears. Senior quarterback Dustin Carrothers has been an outstanding game manager, while throwing for 1,032 yards and 9 touchdowns against just one interception. In the passing game, Bober is the primary target. His 6-5 frame has been utilized 19 times for 318 yards and 3 touchdowns. Storer, who has worn several hats for the offense, caught a touchdown from the tight end spot last week in a wrinkle that the Devils hadn’t shown much. Much of the St. C. offensive success has been predicated on a large, talented and athletic offensive line that features junior Javon Lyons (right tackle), Avery Henry (right guard), Chase Espen (center), Austin Angus (left guard), Trey Delguzzo (left tackle) and Trey Elerick (tight end). Bloom-Carroll’s defense is led by senior Zach Collins, who has shifted from linebacker down to a line spot. Hobie Scarberry and Trace Wisecarver are the leaders at the linebacking corps and freshman Eli Coppess is the top defensive back with four interceptions. Both teams possess quality kicking games. St. Clairsville received a lift with the return of junior Jake Bolyard a week ago. Junior Cameron Shirkey handles the kicking duties for the Bulldogs. He has connected on 9-of-12 field goals with a long of 42. And he also has 25 touchbacks to his credit.